Kerry was interviewed by Rossiya 24 channel during his trip to the Russian capital on Saturday between meetings with his counterpart, Russian Foreign Minister Sergey Lavrov, and Russian President, Vladimir Putin. “I am here to talk with President Putin about Syria and our need to join together to stabilize Syria; try to make peace in a way that keeps it as a whole country, and also – most importantly – also destroy Daesh (Islamic State, formerly ISIS/ISIL). Daesh is a terrorist organization, a threat to all of us. We have a common interest and we need to work together,” he stressed. According to the Secretary of State, it was very important for the Russian people to understand the American approach to the Syrian crisis. “We are not trying to do a regime change. We are not engaged in a color revolution. We’re not engaged in trying to interfere in another country … We’re trying to make peace,” he explained. 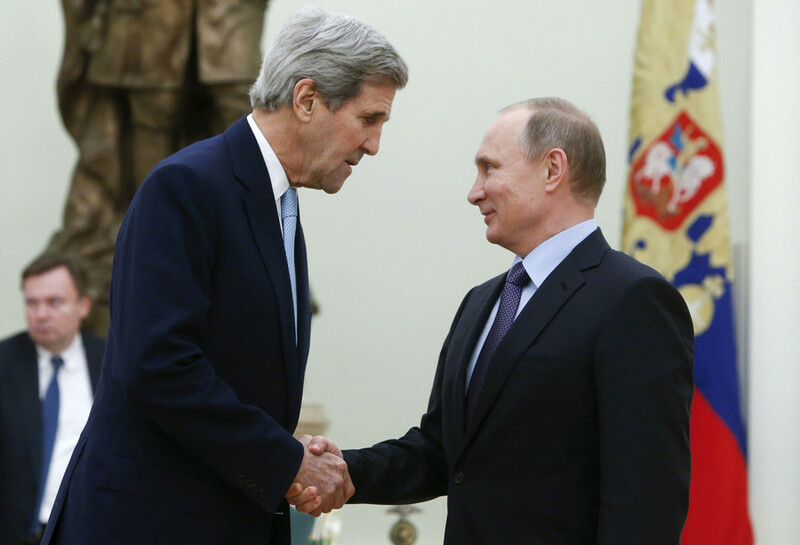 However, Kerry reiterated Washington’s stance that Assad must leave his position for peace in Syria to be achieved. “Russia can’t stop the war with Assad there because Assad attracts the foreign fighters. Assad is a magnet for terrorists, because they’re coming to fight Assad,” he said. “So if you want to stop the war in Syria, and we do, if you want to fight Daesh and stop the growth of terrorism, you have to deal with the problem of Assad. Now, that doesn’t mean we want to change every aspect of the government; we don’t,” the diplomat added. The US Secretary of State also said he did not rule out the possibility of Syrian government forces loyal to Assad being viewed by Washington as a viable part of the operation against IS terrorists. “Under those circumstances, it is possible to envision the army of Syria, together with the opposition, turning against Daesh, providing Assad is not the long-term future of Syria,” Kerry added. As for the ongoing chaos in Libya since the NATO air campaign helped the rebels oust Muammar Gaddafi in 2011, Kerry insisted that removing the dictator was a right thing to do. However, he added that he agreed with President Obama that “not doing enough afterwards to make sure that the transition and the building of a legitimate government took place – that was a mistake” by the US and its allies. 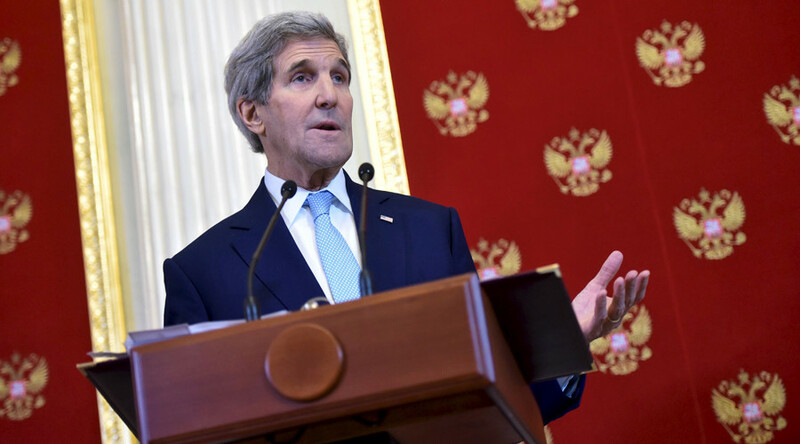 Kerry declined to answer a question on whether Washington informed Ankara about the movements of Russian aviation in Syria before the downing of a Su-24 warplane by Turkish Air Force on November 24. “Russia and the US have de-conflicted, and we have de-conflicted with respect to Syrian airspace and flights we make into the eastern part of Syria to fight Daesh. Turkish airspace is controlled by Turkey,” he said. While Ankara insists the bomber violated Turkish airspace, albeit for a mere 17 seconds, Moscow, Damascus and the surviving Russian pilot have been staunchly denying that the jet overshot into Turkey at any moment of the mission. According to Kerry, the American side does not know the details of what occurred between the Russian and Turkish planes. “We have some indications of it from our radar, we have some sense of what happened, but I think there’s a formal process going on and exchange of information, and I don’t want to comment on the conclusions of that without the information myself,” he stressed. Kerry said that the US and Russia need to “fix the problem of Ukraine,” adding that Washington is “not looking for a confrontation” over the issues. “When I was with President Putin in New York with President Obama, President Obama looked at President Putin and said directly – he said: ‘Vladimir, let’s finish this. Let’s stop this conflict that’s going on about Ukraine. Help us get this settled by implementing Minsk,” he remembered. The American officials have been “working very closely with [Ukrainian] President [Petro] Poroshenko, with the [Ukrainian parliament, the Verkhovna] Rada, with various members of civil society in an effort to push the government in Kiev to make sure it deals with the problems of Donbass,” the Secretary of State said. “We will continue to push the government in Kiev for certain, and they have obligations and they need to live up to their obligations,” he added. “So what’s important now is to try to quickly find a meeting of the minds on precisely what steps can be taken in order to end this issue,” he stressed. Kerry was also asked to comment on President Obama’s speech at the UN General Assembly in September, in which he referred to Russia, Islamic State and the Ebola virus as the main US security threats. “Well, the President wasn’t lumping them together in that way. He was talking about different challenges that we face, and at the time, the question of Ukraine was a major challenge. But we’ve traveled considerable distance since then,” he said. He called the Iranian nuclear deal, the destruction of chemical weapons in Syria and the fresh agreement on tackling climate change as examples of successful cooperation between Washington and Moscow. “We would like to see a normal relationship with Russia and see a strong and powerful Russia contributing to the resolution of disputes on a global basis, because we have enough challenges.” Kerry said.